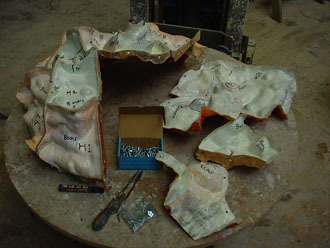 The origins of my sculpture derive from a variety of sources; the self-motivated, the private commission from a client for a particular site and the public competition. 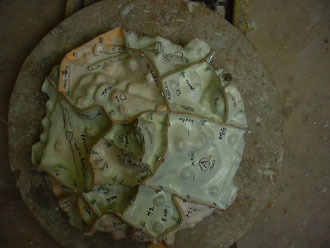 All these give rise to figurative pieces based on modelling from natural forms. I began studying figurative sculpture at Edinburgh College Art in 1968, followed by a more abstract period at both Goldsmith’s and Central St Martin’s where I took my degree in Fine Art. Soon after, while working as assistant to William Pye, I returned to making pieces derived from the figure where my instincts more truly lay. 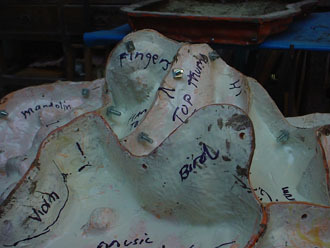 My sculpture is modelled in clay, from which a mould is made and then cast into bronze or a variety of resin and fibreglass materials, depending on the nature of the image and the setting. 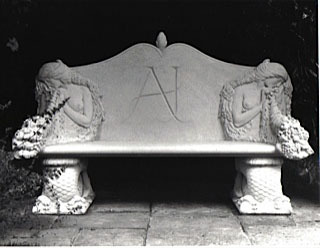 All art is a deception to a lesser or greater degree: for example, a shallow relief such as ‘Relic’ was conceived to deceive in that it depicts a sheet, hanging from a brass rail, on which the image of lovers has been impressed. 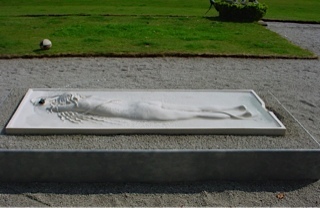 The work that appears to be carved from stone is in fact modelled in clay and cast into stone, using two contrasting stone-dust, resin and fibreglass materials. 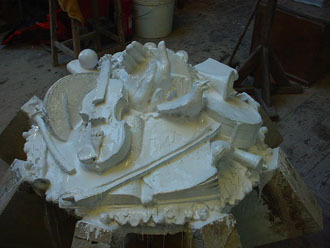 From the mould, three subsequent casts were made. 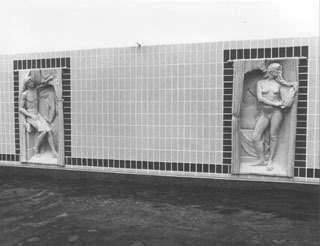 Sculptures such as ‘Afternoon’ and ‘Swimming Pool Reliefs’,also cast in stone, are reliefs where the half depth figures appear fully rounded. Such materials don’t suit all commissions. 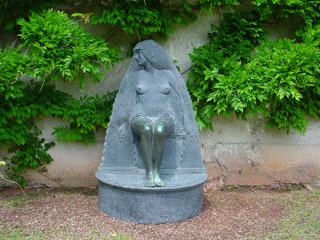 Some have been a combination of bronze and cast marble/slate, as in Garden Seat or Frankenstein a complex use of materials reflects the complex nature of the image. 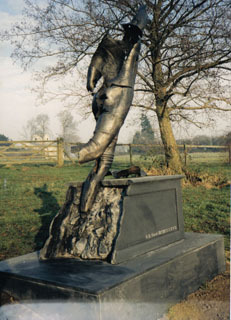 The sculpture 'Frankenstein' was commissioned following the clients involvement in the ballet of that name. 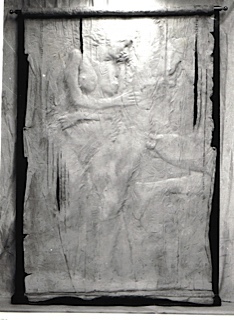 The unfinished dancer leaps from the tomb, his fragmented body referring to both Shelly's monster creation and the sculptor's incomplete wax stage of casting into bronze. There is a playfulness with materials and ideas in many of my sculptures. Hence Jimmy Hill stands on a plinth depicting the history of the game illustrated with four stone footballs. 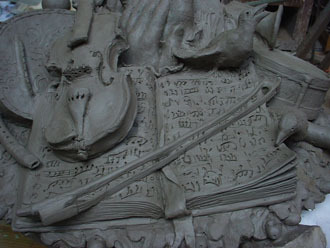 The specific briefs of competitions can at times be overly constraining, but they can also widen the horizons for the sculptor. 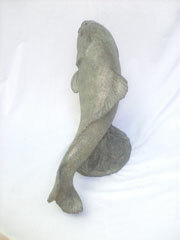 My work, while always figurative, has benefitted from diverse commissions from public and private clients, most recently taking the form of a bronze carp, large enough to house the ashes of a carp-loving husband! 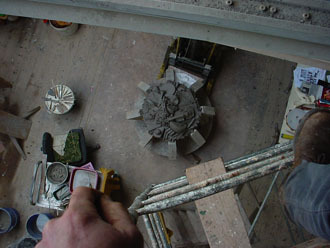 Sequence of photographs showing the making of a ceiling boss for the music room at Portsmouth grammar school. This commission commemorates the life of a retiring headmaster whose interests are reflected in the images. 3. Scene from 20 feet above. 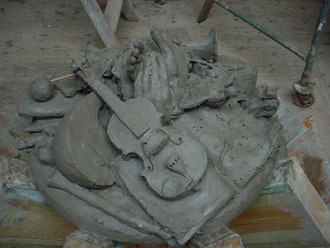 The clay model as it will look in place from the ground. 4. 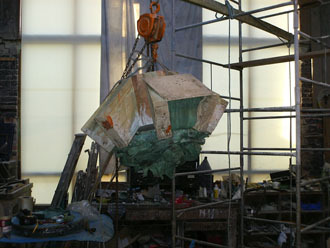 Manoeuvring ready for casting. 5. 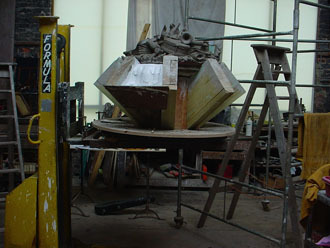 Rotating table on the forklift enables access to all areas. 6. 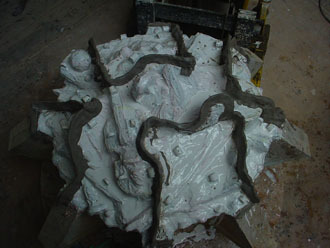 The first layer of silicone rubber is applied to the clay. 8. 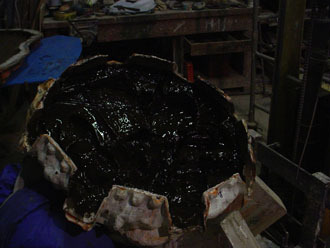 After three layers of rubber, the mould is prepared for the fibreglass case. 10. …and bolted back together. 11. 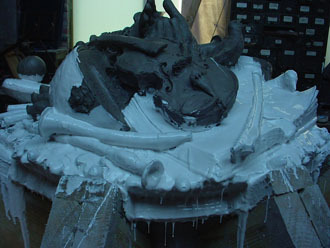 Showing the inside or negative of the boss after the rubber has been de-moulded from the clay original. 12. 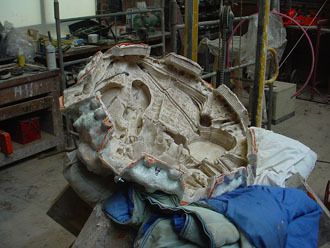 Filling the rubber mould with bronze resin followed by layers of resin and fibreglass. 13. Finally the case is removed. 14. 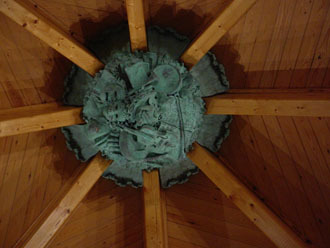 The patinated (or coloured) boss in situ in the concert hall 20 feet above the performers!